Approximately half of all women who suffer migraines report a relation between their headaches and their menstrual cycle, with attacks usually occurring in the few days prior to or following the onset of menstruation. At this time the blood levels of the hormones progesterone and oestrogen are at their lowest. Some women also report suffering migraines mid-cycle (ovulation) which also corresponds with a drop in oestrogen levels. The exact mechanism how oestrogen levels affect migraines is still unclear. Whether it is due to the hormone’s affect on the central nervous system, increasing susceptibility to attacks, or whether it is due to indirect effects such as causing food cravings leading to dietary problems is yet to be determined. In many of these cases, the hormonal fluctuations would appear to be an aggravating factor for Headaches and Migraines and not the main cause; hence it is important to look for other potential causes which may combine to make the sufferer more susceptible at certain times in the menstrual cycle. Many women believe that their migraines will cease with menopause, however this unfortunately is often not the case. Due to hormonal changes at that time, a temporary worsening of headaches and migraine is commonly experienced. Even though the idea of HRT is to maintain stable oestrogen levels, some fluctuation does still occur, which as discussed above can be a trigger factor for migraines. 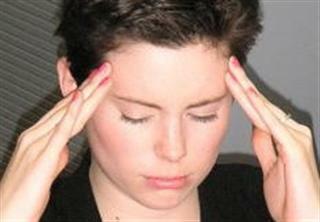 In some cases, HRT has been known to worsen some people’s migraines. It is very important to discuss any experienced changes with your doctor so that any necessary changes to your Hormone Therapy regimen can be made. Migraines will often change in nature during pregnancy, due to changes in hormone activity, however, will tend to return to the normal pattern following childbirth. Migraines may worsen in the first trimester of pregnancy however the majority of women experience an improvement in their condition in the second and third trimesters. If you suffer your first migraine on commencement of using the pill. If you suffer a severe increase in the number or severity of migraines. Quite often a change in the brand or dose of the pill used will improve a patient’s condition. for advice in this area, and to let them know about your head-pain, so that the right oral contraceptive advice can be given, and any other potential problems can also be addressed. Hormonal problems may contribute to Headaches and Migraines, so it is important to have them professionally addressed. It is also important to investigate for other potential causes, as many cases of Headaches and Migraines have more than one ingredient.